A single guide on belt centerline is the most common V-guide request, although belts can have the guide not on centerline, or have multiple guides. It is crucial to understand that the use of V-guides does not fully prohibit tracking issues—tracking problems caused by poor conveyor design and/or improper maintenance are generally not eliminated by adding a V-guide to the belt. Short, wide belts, and long, narrow belts are both good candidates for V-guides, as well as popular for reversing belts. Guides also aid in performance on systems with low tension or low speed. Belts with side loading/diverting may also benefit from use of guides. Again, keep in mind that guides only aid in tracking a belt. They cannot overcome conveyor design or maintenance shortcomings. Guides come in different sizes, with larger belts usually having a larger sized V-guide. To identify V-guide size, measure the width at the widest point, where it attaches to the belt, and then measure the thickness. (See the chart below for dimensions). Guides should not fit snuggly in the grooves on the pulleys − there should be a 1/16" clearance on both sides and bottom of the guide. 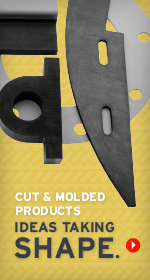 Selecting a notched guide will allow you to negotiate a slightly smaller pulley than with a solid guide. Positioning the guide on the belt is critical for proper performance. Start with the centerline of the guide and tell us where that line is positioned on the belt: i.e. centerline of belt; 2" from centerline of belt, etc. Avoid using a worn belt edge as a reference point to measure guide placement from the edge(s) of the belt, as this may result in an incorrectly positioned V-guide. When multiple guides are required always give center to center of guides.